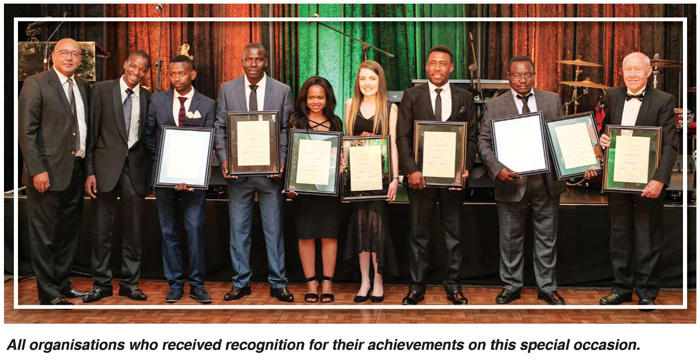 It was with great pleasure that the Farmer Development team learned that we were invited to attend the Annual AgriSeta Excellence Awards gala dinner early in October 2018. Our longest serving Farmer Development Manager, Mr Jerry Mthombothi from the Nelspruit Regional Development office, was nominated to represent the team. Best Governed Rural development Project After AgriSeta Intervention: Dukuza Study Group. We sincerely thank AgriSeta, who’ve been partners with Grain SA Farmer Development for many years now, for both of these awards. We are humbled and thankful that they are seeing the fruits of their investment into our projects and we trust that many years of partnership still lie ahead. 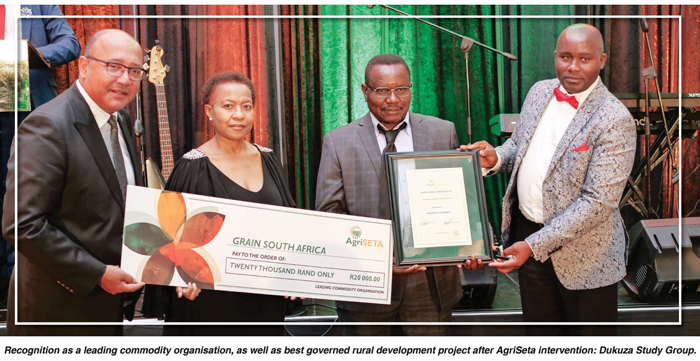 We also acknowledge with gratitude the contribution to these successes made by a dedicated team involved in the Grain SA Farmer Development Programme lead by Ms Jane McPherson. At the same time, we honour the farmers we work with. These hard-working individuals make the most of every opportunity they are presented with to learn and grow. With partnerships like these we believe we can make a difference to national and household food security levels through the establishment of viable grain farming enterprises. This is achieved by bridging knowledge gaps and equipping farmers with the necessary skills and appropriate training in the many diverse aspects of farm operations and management. This is true of the efforts of the Grain SA Farmer Development team. As Grain SA, we are trying to contribute to transformation and the dream of a united, prosperous agricultural sector. We aim to address the challenges of food security, income generation for those who have access to land and ensure good custodianship of the natural resources. We are excited to be working in a sector which has the potential to contribute to all the pillars of rural development. Apart from a passion for transformation and farmer development, it is worth noting that a few key building blocks have been put in place to ensure the high levels of excellence and integrity which form the framework for the good governance for which this programme is widely recognised. We are fully funded and supported by grain trust funds, agri-businesses and other strategic partners equally committed to transformation in the sector. This means that we do not have to involve ourselves in income generation, nor do we participate in trading activities for our own gain. We have no ulterior motive other than to assist in the personal growth and development of the farmers of South Africa because we believe we can make a difference. Good governance is achieved through commitment to organisational vision and conscientious attempts to consider all role-players involved. It requires intentional action that assures stakeholder interests are addressed and reflected in project activity. It is participatory, accountable, transparent, responsive, effective and efficient, equitable and inclusive, and respects the rule of law and policy frameworks. Good governance is responsive to present and future needs of the organisation, and exercises wisdom in decision-making. Good governance requires fair legal frameworks for the full protection of all stakeholders. Transparency means information should be provided in easily understood forms and made freely available to those affected by the policies and practices. Good governance requires that organisations and their processes are designed to serve the best interests of stakeholders. The organisation that provides the opportunity for its stakeholders to maintain, enhance, or generally improve their well-being provides the most compelling message regarding its reason for existence. Accountability is key to good governance. An organisation is accountable to those affected by its decisions or actions. Participation is a key cornerstone of good governance. Participation needs to be tailored to achieve the best results so that all stakeholders feel heard and respected. The Grain SA Farmer Development Programme is guided by policy formulated by both the organisation and its donors. We strive to respect the frameworks in place and design our activities accordingly. We are committed to transparency and have developed a sophisticated system of reporting. Apart from the standard interim and annual reports, we have a detailed informative and interactive web reporting platform. A database has been compiled with a profile for every farmer member. For the farmers participating in the Jobs Fund Project this includes a photo, a copy of ID document, JF contract, GPS co-ordinates of the fields, a copy of the PTO (permission to occupy) and deposit slips. All website reporting on activities includes study groups, farmers’ days, farm visits, training courses, school visits, demonstration trials, farmer of the year participants and strategic meetings with partners and stakeholders. Evidence of each interaction is provided with photos and attendance registers as well as a report of what transpired on the occasion. We have a clear and transparent book keeping system and are proud of the clean audits which clearly reflect the conscientious disbursement of funds. Grain SA Farmer Development has organised TPFA accounts for farmers to assist in the management of monies. These accounts are managed together with each farmer and are reported on weekly. The human development aspect of this work is key and relationships between team and farmer are important. We strive to build open channels of communication where challenges and issues are discussed, and solutions are sought. Equally important are the relationships with our partners and other stakeholders and industry role-players as we strive to build a support system for the programme and a network for each farmer. While recognition is always satisfying, it must never be the goal. H. Jackson Brown says: ‘Don’t do work for recognition but do work worthy of recognition’.